Pristine areas are typically remote, seldom visited and have few obvious impacts. Visit pristine areas only if you are committed to and knowledgeable in the techniques required to Leave No Trace in that particular area. Rocky places with shallow soils, sandy areas, low heath balds, cliffs, bogs and wetlands often harbor residual populations of endangered plants and animals in the Southeast. Avoid travel through these areas altogether. Hike in small groups. The impacts associated with cross country travel are minimized when group size is small, routes are carefully selected to avoid fragile terrain and critical wildlife habitat, and special care is taken to avoid disturbance. 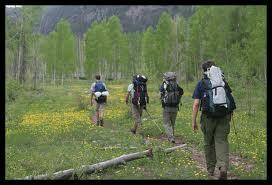 If you are traveling with a large group, hike in groups of no more than 4-6 people. Confine cross-country travel to areas with grassy vegetation cover (which is resistant to trampling) or to areas with little or no vegetation cover. Avoid travel in areas with significant cover of broad-leafed herbs or ferns as these growth forms are more susceptible to trampling damage. 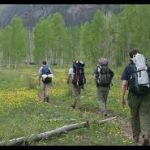 Off-trail travel is also undesirable where established trails exist, where vegetation shows signs of trampling, on steep and unstable slopes, and in places where wildlife disturbance is likely. Spread out while hiking. When traveling cross-country it is generally best to spread out rather than have everyone follow the same route. This will minimize the amount of trampling any place receives and avoid the creation of new trails. In some places it is not practical to spread out; avoid such routes if incipient paths are developing. Choosing a pristine campsite. When selecting an undisturbed site, choose one that has little or no vegetation cover or a durable vegetation cover such as grasses. Camp away from trails, other campers, lakes, streams and critical wildlife habitat. Avoid “beauty spots” that might attract other campers. Select a site well away from high-impact areas that shows no evidence of previous use and is unlikely to be used after you leave. Durability of the ground surface is the most important consideration in determining exactly where to set up tents and the kitchen. Forest duff is acceptable if it is possible to avoid crushing any plants or seedlings. Grassy areas and dry meadows can also make good pristine campsites. They are quite durable and recover rapidly from the effects of one night of low-impact use. When deciding whether or not to camp in a meadow, consider whether you will impact other users or wildlife. Camping in remote areas. On pristine sites it is best to spread out tents, avoid repetitive traffic routes and move camp every night. The objective is to minimize the number of times any part of the site is trampled. In setting up camp, disperse tents and the kitchen on durable sites. Wear soft shoes around camp. Minimize activity around the kitchen and places where packs are stashed, and watch where you walk to avoid crushing vegetation. Take alternate paths to water and minimize the number of trips by carrying water containers. Avoid using the same general area for more than one night. When breaking camp:, take time to naturalize the site. Covering scuffed up areas with native materials (such as leaf litter or pine needles), brushing out footprints and raking matted grassy areas with a stick will help the site recover and make it less obvious as a campsite. This extra effort will help hide any indication that you camped there and make it less likely that other backcountry travelers will camp in the same spot. The less often a remote campsite is used, the better chance it has of retaining its pristine qualities.